Climb up the Mountain and see what lies behind. Hold your breath and enjoy the fresh air and bird eye view behind you. 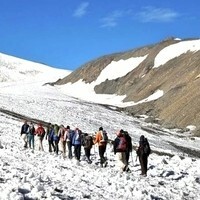 All kinds of mountaineering expeditions are handled from climbing peaks and expeditions above 7000 m in India and Nepal. Ladakh is mountaineers delight given by its several mountain ranges like Karakoram, Zangskar and Ladakh Ranges. The most famous and easily accessible is the Stok Khangri massif in Zangskar range, south of Leh. 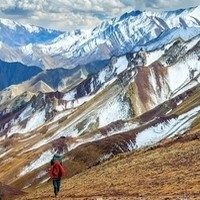 The base Camp for various peaks of this massif is about four days trek from the village of Stok or Spituk. Among its known peaks Stok Khangri (6,150 mtrs.) 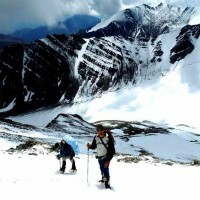 is the most famous between tourist and localities as a trekking peak. It offers a spectacular view of Indus valley and Karakoram Range. Other peaks in this area include GolaibKhangri (5,900 mtrs. 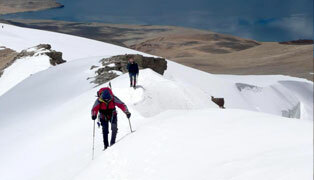 ), adjacent to Stok is Matho west (5,950 mtrs.) and many unnamed peaks in the same range. The Nun-Kun massif in the greater Himalayan range is easily accessible from Kargil-Padum road. The shortest possible approach is to march to the base camp makes this massif the most attractive climbing destination in the great Himalayas. Among its six known peaks accessible from Suru Valley is Nun (7,135 meters) and Kun (23,213 feet.) is the highest.